Last thoughts on the Oscars. Leave it to the Oscars to frustrate me even when they’re properly awarded. On Friday, I loudly declared my belief in inavataribility, arguing that, given the Academy's lifelong emphasis on movies' commercial success, there was no way it would give Best Picture to a $12.6 million-grossing indie (The Hurt Locker) over a well-reviewed juggernaut that made 50 times as much (Avatar). On Sunday, it gave Best Picture to a $12.6 million-grossing, etc., etc. How did this act of cinematic sanity come about? I'd like to say the Academy stiffed Avatar because, apart from its next-step visuals, it stunk. But when you have an outcome that is so at variance with historic precedent, you generally have to look for circumstances that are themselves at variance with historic precedent. And here, I think, it’s safe to say that the Academy’s newfangled ten-nominee, weighted-voting rules for Best Picture cut heavily, perhaps decisively, in favor of The Hurt Locker. I’d mentioned this factor as a persuasive rationale for a Hurt Locker victory, but unlike folks such as Rick Hertzberg and Ross Douthat, I was not myself persuaded. (We live. We learn.) And though I am still not a fan of overstuffing the category with nearly a dozen nominees—a decision the Academy made, more or less explicitly, to protect itself from its own dubious judgment—I can’t be unhappy about a process that (this time at least) rewarded quality over profitability. As for the other winners: Kathryn Bigelow’s Best Director win was no surprise on the merits, and Hollywood of course loves a first (as in, woman to win the award) no matter how belated it may be. Mo’Nique was the next-closest-thing to a lock for Best Supporting Actress for Precious; and Christolphe Waltz’s Supporting Actor win for Inglourious Basterds was an actual lock: There isn’t a pawn shop in the greater Los Angeles area that wouldn’t have advanced him cash last week based on the promise that he’d bring his statuette in Monday morning. The screenplay winners were more surprising and, I think, rather less deserving. Geoffrey Fletcher’s adapted script for Precious somehow stole the prize from favorite Up in the Air, completing the long-gathering snub of Jason Reitman’s film, which was an early favorite for several Oscars (including Best Picture) but has been fading since the beginning of the year. It’s a shame, because though it had its flaws--like pretty much all the hopefuls this year--Up in the Air was a fine, sophisticated entertainment. Indeed, the comparison with Hurt Locker is instructive: In one case the early, largely unanticipated wins led to more wins and more wins and, finally, the biggest win of all; in the other, awards underperformance sucked away the initial enthusiasm until a fine film found itself wrapped in the aura of a loser. Given the Big Mo of Hurt Locker, its win for original screenplay (by Mark Boal) was less of a shock, but still required toppling Quentin Tarantino’s script for Inglourious Basterds. There’s no grand cosmic injustice here, but I do think it’s an all-too-typical case of category confusion: Boal’s screenplay was quite good, but it had its flaws (chief among them, a choppy, episodic quality) and it was not, in any case, a primary reason for the overall strength of Bigelow’s Oscar-sweeper. (Those would be Bigelow, more Bigelow, and Jeremy Renner.) Tarantino’s script had its flaws as well--moral obtuseness, occasional flirtations with juvenilia--but it was a work of fierce imagination and originality. (You can be sure no soldier is going to sue him, charging that he merely stole the guy’s life story.) Like Up in the Air, Inglourious Basterds deserved better. Which brings me to the lead performances categories. If the Academy (with the help of a weighted voting system few of its members probably understood) finally, decisively abandoned its commercial criteria for Best Picture, it scrupulously adhered to another tradition at least as pernicious: its eagerness to expand the universe of performers who can place the honorific “Oscar-winner” in front of their names by stiffing worthier candidates already so endowed. On the surface, Jeff Bridges’s win for the understated indie Crazy Heart and Sandra Bullock’s for the $250-million (-and-counting!) The Blind Side could hardly be less similar. The former was seen by almost as few people as Hurt Locker—heck, I watched it twice, and still have to catch myself from misnaming it Crazy Horse—while the latter rode a wave of lucre so steep that it carried an actress who won a Razzie for her work this summer (in All About Steve) all the way to the opposite extreme of cinematic accomplishment. But the two Oscar wins have far more in common than not. Begin with Bridges: I like the man, you like the man, and, from all appearances, everyone in Hollywood likes the man. He has been working in film for four decades, belongs to an amiable Hollywood dynasty, and, prior to this year, had been nominated for four Academy awards. Moreover, he delivered a good performance in Crazy Heart, one perhaps worthy of Oscar nomination. But it was a fairly narrow, unchallenging role, and one we’ve seen performed better before, both in its general contours (Mickey Rourke’s revelatory turn in The Wrestler just a year before) and even in its particulars (Robert Duvall’s Oscar-winning turn in the far superior Tender Mercies—if this film were fresher in memory, there’s no way Bridges would have won; indeed, with all its parallels, Crazy Heart might have been forced to brand itself as a remake. Watch out, Kate Winslet: Down-and-out country singer is the new Holocaust movie!). 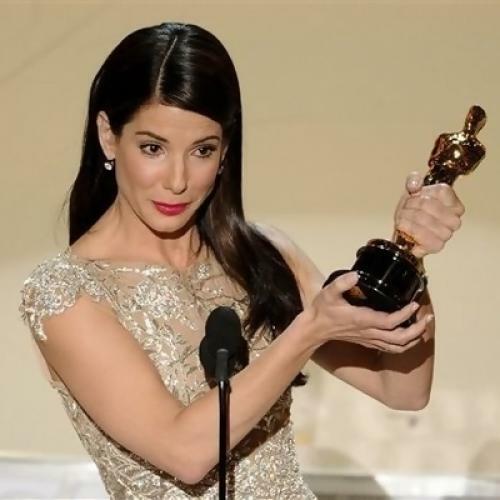 As for Bullock, give credit where it is due: It used to be fairly commonplace for big-screen melodramas to be among the year’s top earners (think, Kramer vs. Kramer, Rain Man…). But these days, the high-grossers are limited almost exclusively to sci-fi, fantasy, or superhero franchises on the one hand, and animated pictures on the other. For the story of an adoptive football mom—who is at no time bitten by a radioactive insect or abducted by aliens—to clear a quarter-billion dollars is a genuine accomplishment, and one that clearly depended on Bullock’s big-screen charisma. That alone may merit a Best Actress nomination. But, as with Bridges, a win? Really? Moving through the actress nominees, we have two intriguing young performers (Gabourey Sidibe, Carey Mulligan), both nominated for the first time and both, one hopes, with their best work yet to come. Similarly, among the actors we have two relatively unknown (at least to a mass audience) first-time nominees (Colin Firth, Jeremy Renner), not quite so young but still on the lucky side of 50, and both more than capable—in particular Firth, who should have won this year—of garnering future nominations. That’s four down in each camp: two already-rewarded vets, two relative newcomers. Who’s left? Well-known, well-liked Jeff Bridges, who, at 60, probably isn’t going to get another bite at the apple; and well-known, well-liked Sandra Bullock who, at 45 (yes, it stinks to be a woman in Hollywood), is an even longer shot to return, barring a profound reinvention as a character actress. In the business world, they might be given gold watches. In Hollywood, they receive golden men.